Livio was born in Rome, on Oct 13th 1960. He has a law degree from (Universita’ di Roma La Sapienza), and worked as a journalist for almost ten years, covering in Middle East and Iraq, then shifted to international and domestic political and economic affairs. 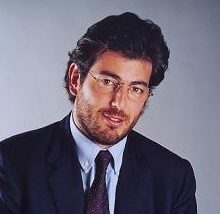 His last assignment as a journalist was economic editor in chief of Adnkronos, the largest private wire service in Italy. Livio joined the private sector in 1998 in Philip Morris, then he moved to Lottomatica, market leader in payment services, with the position of Vice President for Marketing and Communication. He returned to Philip Morris Italy as General Director in 2005 and as General Manager for Philip Morris in the Slovak Republic from 2007 until 2009. From February 2009 up until March 2014, Livio has headed Corporate Affairs for Philip Morris for the European Union Region. And from 2014 to 2017 he led the Corporate Affairs department as Vice President Corporate Affairs for Eastern Europe, Middle East, Africa and Duty Free, where he was also accountable for the business in Israel. Since March 2017, he was appointed Vice President for Global Partnerships and Cooperation, fully focusing on the transformation of the business with the new purpose of designing a smoke free future, replacing cigarettes with reduced risk products. He also had experience, heading the organization of the National Basketball Association tournament in the Italian capital. He was a board member or of the Giunta Unione Industriali di Roma, member of the advisory Board of the Guggenheim Museum in Venice, and of the American Chamber of Commerce in Italy. Livio has three children, Pietro, Nina and Alessandra. He is the eldest of four brothers.